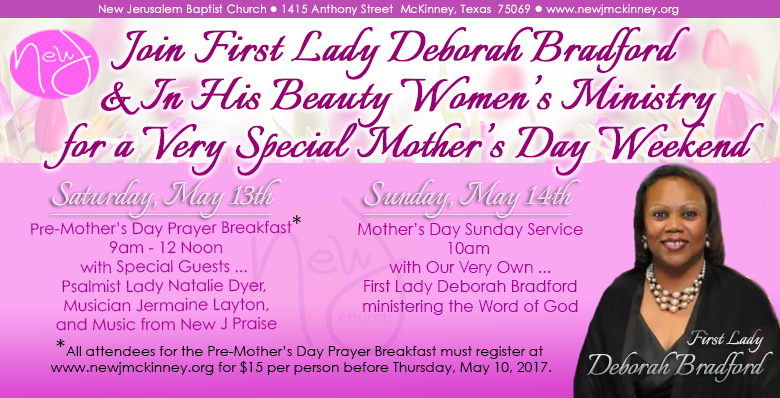 Join First Lady Deborah Bradford & In His Beauty Women’s Ministry for a very special Mother’s Day Weekend! On Saturday, May 13th from 9am – 12 noon, we’re hosting a Pre-Mother’s Day Prayer Breakfast with special guests Psalmist Lady Natalie Dyer, Musician Jermaine Layton and Music from New J Praise. We are accepting registrations online (below) and on site the day of the event, May 13th. On Sunday, May 14th, the celebration continues with Mother’s Day Sunday Service at 10am. Our very own First Lady Deborah Bradford will be ministering the Word of God. If you have any questions, email us at connect@newjmckinney.org.